Vik Nagjee serves as Director of Healthcare & Life Sciences at Sirius Healthcare. 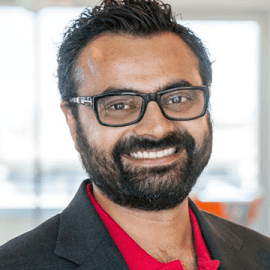 Prior to this, he was the VP and CTO for Global Healthcare Solutions at Pure Storage, where he was responsible for Pure’s healthcare solutions, strategy, market development and thought leadership. Vik has more than 15 years of experience working in the healthcare technology sector and held several roles at Epic and InterSystems. Prior to joining Pure, Vik was the CTO at Epic, the world’s leading electronic medical records provider, where he directed the architecture, implementation, execution and business development of Epic’s new service provider business, Epic Hosting. Vik began his career at Epic as a software engineer and built the foundations of Epic’s core infrastructure. He then moved on to several roles within Epic, where he partnered with CIOs and CTOs at the largest healthcare organizations to optimize the success of multi-million dollar installs and supported sales opportunities. Vik was also responsible for product security and regulatory compliance to help ensure the security of information systems and patient health information. In his role at InterSystems, he helped prospects, application partners and end users find the perfect solutions for their data, processing and system architecture needs. Vik has Bachelors of Science in Industrial Engineering, Computer Science and Accounting from Purdue University.